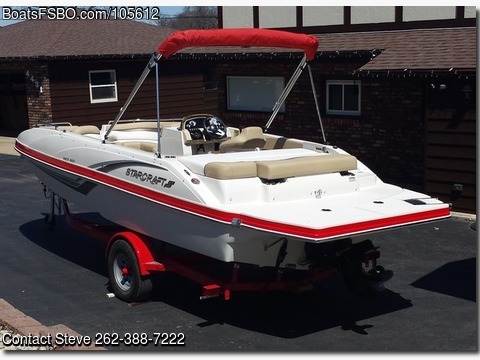 Contact the owner at 262-388-seven two two two...Love this boat but it is too big for the river we live on. Replacing it with a small pontoon. 2017 purchased new in Dec of '17 so only used 1 season Starcraft MDX 201 12 Passenger Deckboat. Mercruiser 4.5L 200 Alpha IO. New Trailmaster trailer wsurge brakes included. Lifetime hull warranty, tach, speedometer, fuel gauge, 44 gal built in fuel tank, circuit breakers, navigation lights, ski tow, temp gauge, docking lights, sundeck, stainless steel bow and stern eyes, mooring cleats, cup holders, AMFM stereo wMP3 Aux port and marine grade speakers, bow platform wboarding ladder, removable 36 qt cooler, in-floor storage, removable table wlocking base, engine compartment ventilation blower, automatic bilge pump, stern swim platform wboarding ladder, snap-on cover.